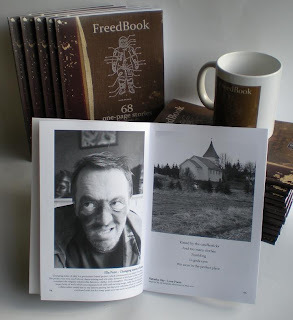 One small step for artists, one giant leap for FreedBook! Yesterday (24/11/2012) an intrepid band of artists reached all 4 corners of London's transport compass. Over 80 miles was traversed on foot, buses, trains and a tram, where we delivered 7 freedbooks into the Books For London libraries. The 6 hours zipped-by in a frantic and fun journey with plenty of chatting and swappping ideas. We started at Acton Central where myself, Natalie, Effie and Jess met Robert Good, Peter S Smith, Dean Reddick, Chris Gilson and the local Bookswap rep Sara Nathan. We picked up Ella Penn at Ealing Broadway and Books For London founder Chris Gilson gave us an inspirational Henry V style speech on the bridge at West Ealing before retreating to his HQ. Heading towards Enfield Chase we picked up Melanie Ezra and Dan Leek at Kings Cross. After finding a suitable phonebox to release FreedBook No.3 our number swelled with the arrival of Sonia Jarema. A few peeled off in Central London as we headed east to Charlton (pic above), but we we're bolstered by Stephanie Wilkinson and Stuart Simler and several hundred fans on the their way to the Charlton vs Hudddersfield match. 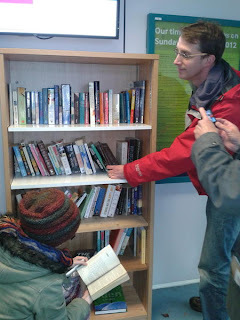 Next to the boundary of our Travelcard's reach at Coulsdon South where we found that the Bookswap shelf had disappeared. The station manager helped us and we found a suitable coffee table in the waiting area to launch book No.5. On the last lap we reached Wimbledon station by tram and rendezvoused with Chris Gilson once again and then a short hop to Raynes Park where we delivered our final FreedBook of the day. After 6 hours of travelling we gratefully returned home to wine and tea, with a special space in our hearts for London's Transport system and its employees who never let us down! Every train on time! Keep an eye out for our next exhibition by Brian Benge. To view who was featured in the book visit the Artists page on the right. We're proud to present our first publication as a group. The FreedBook. 68 One-page stories from 50+ artists. We'll be releasing our books into the Books For London libraries on the 24th November. So come and pick one up for FREE. More information on our launch on the Freedbook Website page. If you would like to buy a copy then click on this link BUY or visit the Sampson Low website. To see which artists are featured in the FreedBook then visit our Artists page and find links to their websites. The next CollectConnect exhibition will be organised by Bryan Benge in early 2013. Thank you to all the artists involved.